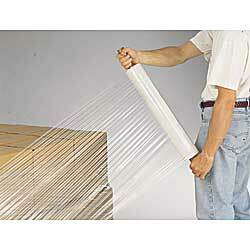 Super strong, puncture-resistant cast stretch wrap has excellent holding power. Clings to itself. Will not leave sticky residue or harm finishes. Smooth, quiet release off the roll. Each case includes an applicator handle. 3" roll core. Order in case quantities specified, priced each. IN STOCK.